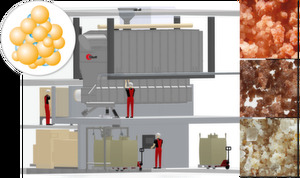 At Vitafoods 2019 in Geneva, plant engineering and process development specialist Glatt Ingenieurtechnik will be presenting a new plant concept for continuous powder agglomeration: "GF ModFlex" is extremely economical, fits into any hall thanks to its modular design and can be flexibly adapted to meet individual customer requirements. Transferring fine powders and powder mixtures into uniformly porous, practically dust-free, highly soluble and perfectly meterable granulates – this is what the new "GF ModFlex" plant concept achieves in an endless loop, with consistent safety and quality guaranteed. Multi-step and multi-zone processes offer almost unlimited freedom in product design. The space-saving innovation is based on the established Glatt fluid bed technology and, thanks to gentle process control, preserves the nutritional and functional properties of the products. 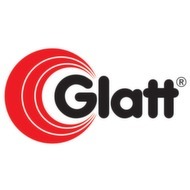 With its compact modular system, Glatt caters for manufacturers who want to upgrade or renew their machinery at short notice, in certain space conditions, and with target production volumes of between 100 kg/h and 3000 kg/h. The Atex-compliant concept, equipped with WIP cleaning, also boasts an extremely short installation time of just 12 days. A demand-oriented operating, room and zone concept is also supplied, alongside the self-developed "GlattView Varia" control system. Applications for which fluidized bed agglomeration is perfectly suited include vitamin formulations, minerals and trace elements: their bulk density must be adjusted so they can be filled to an accuracy of one-hundredth of a gram in cans, capsules or sachets, or pressed into effervescent tablets. This also applies to dried probiotics or sports drinks. In the case of protein shakes, high porosity and wettability is vital for protein powders to dissolve without residue in water, milk or plant-based drinks. Polyols such as xylitol, maltitol or lactitol, raw materials with added value and components for premixes can also be optimally adjusted by agglomeration. In the fluidized bed, powders for capsule and coffee pad systems are also precisely metered, flowable and uniformly adjusted, and their particle structure specially adapted to the equipment and the packaging design.